Graceful, arched stems are individually beaded with small, glossy berries in shades of green, terra cotta, crimson and coffee. ORIGIN: Crocosmia is native to South Africa. “Crocosmia” comes from the Greek words “krokos” (saffron) and “osme” (smell). 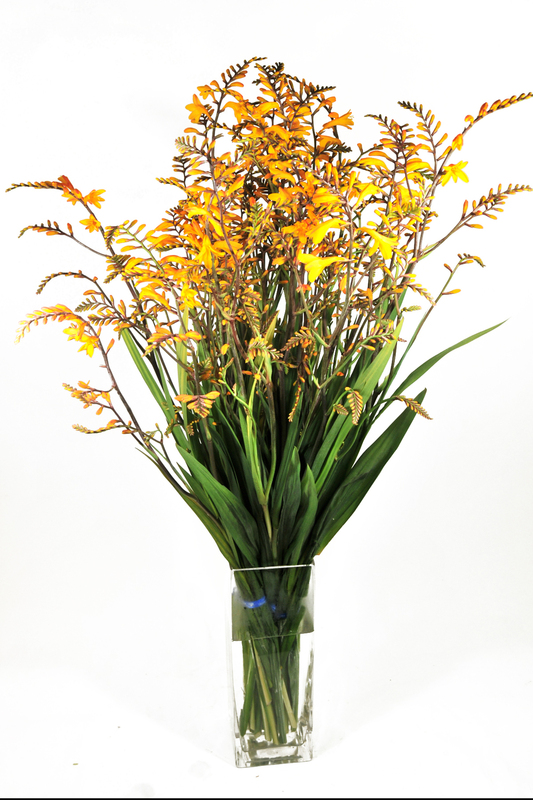 Dried Crocosmia flowers, especially when placed in warm water, have a strong saffron smell. The common name “Montbretia” is a homage to Antoine François Ernest Conquebert de Montbret, one of the botanists accompanying Napoleon’s invasion of Egypt from 1798 to 1801. DISPLAY: Excellent for textural, botanical effects in floral arrangements. For extra impact in arrangements, feature berried stems that have been dried and painted silver, gold, red or given a clear shine.